For my employer, I’ve been working on setting up a continuous integration and release pipeline using Team Foundation Server (TFS) on-premise. Earlier this year, I had started experimenting with the standalone Release Management 2015 tool. Although I made some progress, the XAML based workflows and client tooling left a lot to be desired and I ended up reverting to using msbuild deployment options directly from the build itself. Not ideal, but better than nothing. I was ecstatic to learn that a web-based version of Release Management had been integrated into Visual Studio Team Services (VSTS), formerly Visual Studio Online, as part of a preview release. But much to my dismay, the new Release Management (in preview), wasn’t scheduled to be available for on-premise TFS until later in 2016. VSTS typically get’s new updates every three weeks, with those updates rolled to TFS on-premise on a quarterly cycle. It was clear that the Release Management 2015 client and server tool were going away so it didn’t pay time to continue exploring the solution. After resigning myself to the fact that I’d have to wait to get my hands on the new Release Management tools, the release candidate for TFS 2015 Update 2 was announced. Much to my surprise and excitement TFS 2015 Update 2 RC1 included the new web-based version of Release Management. Dude, Where’s My IIS Deployment? With the new bits installed on the server, I finally had access to the new web-based Release Management UI and could start following along with some of the online tutorials I was seeing for VSTS. 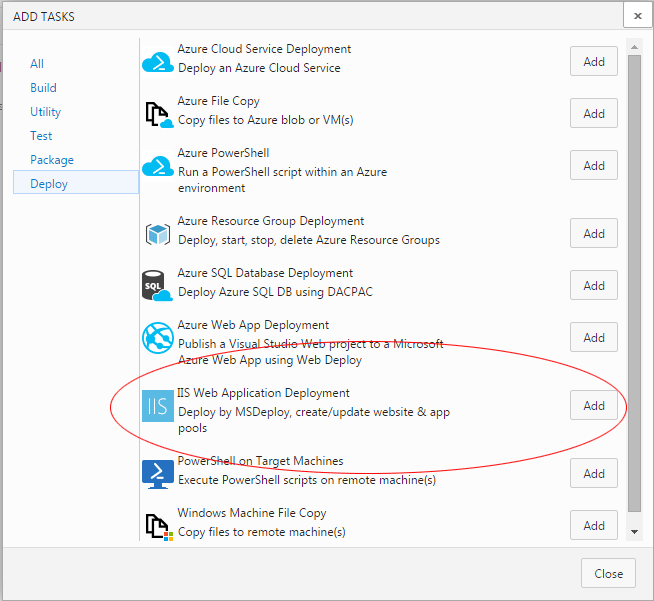 In one of those tutorials, I saw reference to an “IIS Web Application Deployment” task. Just the task I needed to deploy my application to IIS! Unfortunately, this task wasn’t available on my on-premise installation? With the source in hand, the next step was figuring out how to get it deployed. I found an article that discussed how to deploy custom tasks… not a task for the faint of heart. As I prepared myself for the task, I learned that since that post was originally made, Microsoft had released the TFS Cross Platform Command Line Interface which not only simplifies the process but is the supported and recommended method for installing extensions. Installation of the tool is easy with node.js and npm. The first step is to get logged into the TFS server. By default, the logon process is going to look for a VSTS personal authentication code which doesn’t apply (yet) to TFS on-premise. Thankfully basic authentication is supported, but you’ll need to enable it on your TFS server. While you’re enabling basic authentication, I strongly encourage you to configure your TFS / IIS server to force SSL. Sending a basic username and password without an encrypted connection is ALWAYS a bad idea. One logged in, you can run additional commands to view the list of installed tasks. description   : A thin utility task for file decryption using OpenSSL. If I recall, when I grep‘ed the output for the IISWebAppDeployment task nothing was found. This should be easy. Let get that deployed. been uploaded. To replace the existing definition, re-register the task definition before uploading the package. $&!#? Already Been Uploaded? Seriously? If we look at the task.json file, we notice a “visibility” attribute with the value of “Preview”. Although I couldn’t find documentation, this “Preview” tag must prevent the UI for seeing the task. So lets get that changed. Edit the Tasks/IISWebAppDeployment/task.json file to remove the “Preview” option, or apply the following patch. --task-path  Local path to a Build Task. --overwrite  Overwrite existing Build Task. --auth-type    Method of authentication ('pat' or 'basic'). --username     Username to use for basic authentication. --password     Password to use for basic authentication. --service-url  URL to the service you will connect to, e.g. https://youraccount.visualstudio.com/DefaultCollection. --fiddler      Set up the fiddler proxy for HTTP requests (for debugging purposes). --proxy        Use the specified proxy server for HTTP traffic. --help       Get help for any command. --save       Save arguments for the next time a command in this command group is run. --no-prompt  Do not prompt the user for input (instead, raise an error). --output     Method to use for output. Options: friendly, json, clipboard. --json       Alias for --output json. So let’s try deploying that again with the –overwrite option. Task at C:\Users\gheeres\vso-agent-tasks\Tasks\IISWebAppDeployment uploaded successfully! Checking the list of available tasks, we see that it is now available. In a future post, I walk through our release configuration.